In general, I don't believe that objective reporting is a thing that can happen. I don't believe it's actually humanly possible to be completely objective about, well, anything. As humans we always have opinions and beliefs that influence who and what we like or dislike. Every opinion we have is subjective, because it's always filtered through our personal experiences of the world. So, that disclaimer in place, I'd just like to say that I know, I know that I am not objective about The Maze Runner. I have read the books, and I absolutely hated them. Seriously. I wrote a whole big long thing about it. I found the books to be poorly written, sexist, and generally disappointing. They never delivered on the coolness of the premise, and like a lot of shows that I could name, they never managed to sufficiently explain all the weirdness or wrap up the conspiracy theory in a satisfactory way. It just did not work for me. Obviously, then, I was skeptical going into the movie. On the one hand, this movie contains some of my favorite up and coming actors: Dylan O'Brien (Teen Wolf), Thomas Brodie-Sangster (Game of Thrones), and Kaya Scodelario (Skins). Also, the promotional pictures look encouraging: a racially diverse cast that looked realistically dirty and sweat-stained, with a setting that looked convincingly rural and makeshift. Encouraging all around. On the other hand, though, the source material is a badly written, badly sexist book that has a couple of good moments, but overall never really works. It's like James Dashner was writing without an outline, and when he got to the end of the book, he realized that he didn't have the answers for any of the important plot questions. So he wrote another book, assuming that he would be able to answer them at the end of that one. But he couldn't. So he wrote another book, and managed to avoid answering them satisfactorily in that one too. In order to be safe in writing this review, then, I brought a friend with me to the movie. Mostly because she's my friend and I like her, but a little bit so that I could get a non-me opinion on the movie. See it through someone else's eyes. This friend has not read the book, and I was hoping that she would be able to provide a contrasting view. The conclusion? Yeah, neither of us liked it very much. The movie, if you're not aware of the source material, is yet another young adult dystopian narrative. Thomas (Dylan O'Brien) wakes up in an elevator with no memory of anything but his name. He's arrived in a Lord of the Flies-esque land - it's a giant field in the middle of a bunch of massive walls. The inhabitants of this land are all teenage boys, all of whom only remember their names, nothing else. As far as they know, they've been abandoned there, in a field in the middle of an endless maze full of monsters. No idea why. The boys have formed a sort of society there, dividing duties and trying to keep themselves alive. Every month another boy comes up in the elevator, along with some limited supplies. But mostly they make do on their own. Thomas is apparently the first boy to come up who immediately questions the status quo. 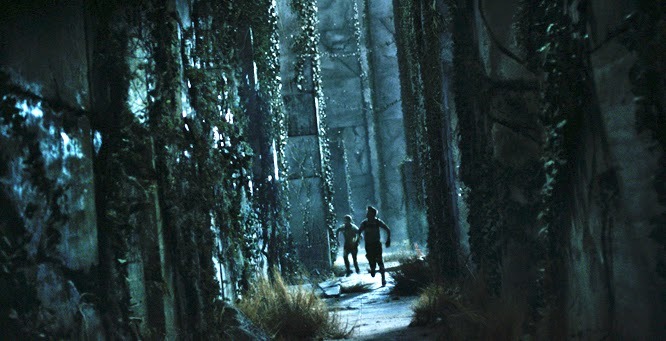 While the leaders, Alby (Aml Ameen) and his second, Newt (Thomas Brodie-Sangster), are reasonably content to keep the boys alive and safe within the walls while sending runners out to try to map the maze and discover an exit, Thomas immediately assumes that there must be something else they can do. He goes about trying to prove that, breaking every rule they put in front of him, and repeatedly running out into the maze in a hope of finding some way back...to wherever it is they all came from. Also there's this thing where the monsters in the maze can sting you, and when they do, you go a little crazy and then die. Unfortunately for Thomas, everyone who's been stung by a Griever immediately tries to kill him, for reasons that he does not understand because he cannot remember. And to make matters even more complicated, the day after Thomas arrives, the elevator comes back, but this time with a girl who says Thomas' name and then immediately passes out. I don't want to get too deep into the plot, because to be honest, there's not a lot of plot to get into. There really isn't. It follows a very predictable formula, with one or two twists, but it's essentially the plot you get from knowing the premise and from understanding that Thomas is the "chosen one" or whatever. And for all that I hate the book, I give the filmmakers here a lot of credit: they created a perfectly reasonably okay movie out of it. The film is visually stunning, has excellent effects, and the dialogue is halfway decent if boring as all get out. The actors are clearly very talented and trying their hardest to be interesting. It's just that there isn't a whole lot to work with. In adapting this book to film, the writers very shrewdly cut out a lot of the more cracktastic elements of the plot (bio-engineered surveillance camera bugs, telepathic connections, inexplicable medical mysteries), but the problem is that without the crack, the story is oddly bland. 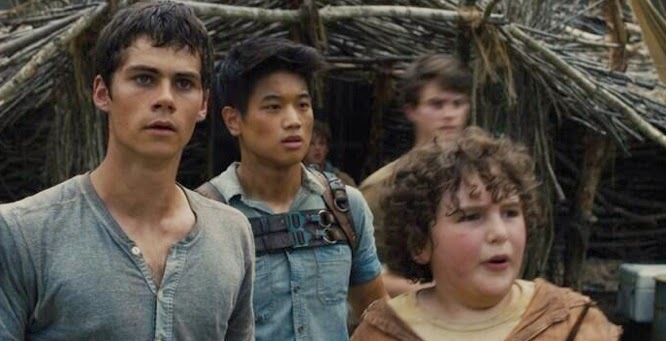 Dashner has gone on record saying that he wrote The Maze Runner as a reaction to the idea that a group of boys left to their own devices would go feral, as in The Lord of the Flies. I respect the idea of trying to repudiate that, but the problem is that it doesn't work. A group of boys would go feral. When he tried to create a world that's perfect except for the external monsters, Dashner made a world that is fundamentally dull and does not reflect true human nature. It just doesn't work. 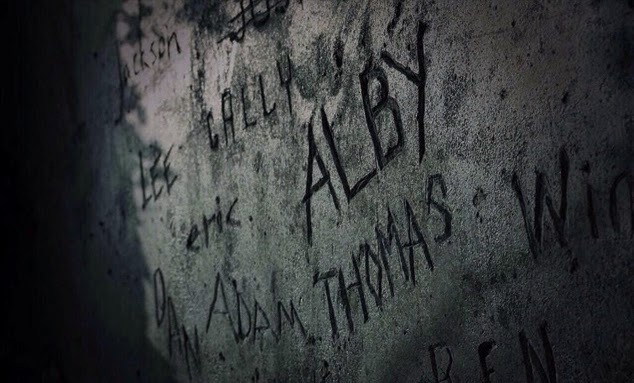 Additionally, for all that I greatly appreciate two of the most important characters in the story (Alby and Minho) being played by actors of color, I think it's a little problematic that Thomas is the white-boy savior, one who Minho immediately defers to and Alby is willing to give almost limitless lee-way. It's like because Thomas is white and curious, the other characters know that they need to step back because the protagonist has arrived, and that's just bad writing. The writers did do a good job in removing most of the terribly sexist elements from Theresa's plotline, getting rid of her obsession with Thomas and her basically being a super-genius macguffin, but like with a lot of this, when they got down to it, there's not much left. Theresa as a character is mostly made up of tropes. If you get rid of them, all you have is a very bland girl-character who does virtually nothing. That's not an exaggeration, either. Theresa does almost literally nothing in the entire movie. Her character could have been cut without a single problem. She doesn't even spout off any necessary dialogue. It's nice that she's no longer there as part of a romantic subplot, but now she's barely there at all. For the most part, I really appreciate the changes made to the story, and most of them are more cosmetic and logical than anything, but there is one shift that really bothers me. In the books, (SPOILER), the character Newt walks with a pronounced limp. We learn that this is because Newt used to be a runner, but got hurt while he was out in the maze, and now he just works back in the glade. It's not a huge deal or anything, but it's an extra bit of character development for one of the leads. 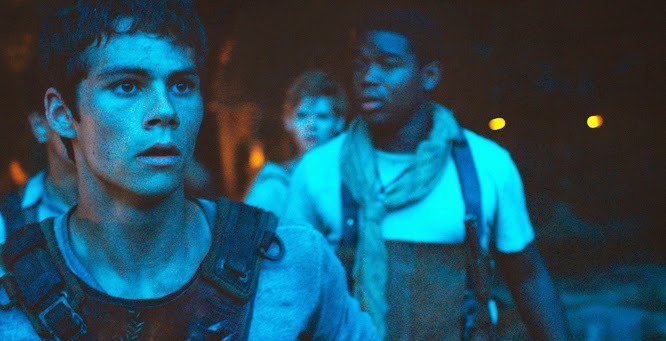 As the books progress, however, we get more detail on that incident, and eventually Newt discloses that he did not break his leg by accident - he broke it when he decided that he had had enough of running, and climbed a wall so he could jump off. He didn't manage to climb high enough before he jumped, and so the fall only broke his leg, not his neck. It's a pretty grim subplot, but there's something incredibly moving about it. It was one of the only subplots from the book that I liked. Not because it's overly depressing, but because it answered a very important question: What about the people who, unlike Thomas, don't want to fight to survive? In a story about survival no matter the personal cost, it's very important to see characters like Newt, who have struggled with depression and who seriously question the point of their survival at all. Is it worth it? It bothered me, then, to realize that the movie has completely cut this subplot out. As far as I could tell, Newt didn't walk with any discernible limp in the film, and they certainly never talked about his past like that. So I wonder whether it will come up in the sequels at all. All that having been said, it's a perfectly competent movie. The problem is that when "perfectly competent" is the best thing you can say about a film, that's a terrible sign. Without the really absurd flourishes that Dashner stuck in the original novel, and without some intense revision of the storyline, the movie just sort of goes through the motions. It's tense in the moments when you feel it ought to be tense, and vaguely emotional in the moments when you think that feelings should be happening. It's fine. But there is absolutely no fire or verve or deeper anything to this movie. The real problem comes back to the source material. It's just not a very good book. Worse, it's a beloved book, and so the screenwriters felt beholden to/the studio felt the need to pander to the fans of the original work. And so the writers were not allowed to make any substantial changes, for fear of angering the mighty fan. Unfortunately, this is a story that needed a lot of changes if it was going to be halfway palatable, and it didn't get them. I think my friend put it best as we were hanging around my apartment after the film. She'd been quiet for a few minutes, and when I asked her what was up, she said, "I'm still thinking about the movie. Or, well, I'm think about how there's nothing to think about." Because, in the end, there wasn't. There was not enough depth in that movie for us to come out of it having any kind of conversation. It just happened, then we forgot all of it.